By jrosenhouse on May 31, 2016. After my win in round two I was excited for round three. My opponent sported a 1952 rating, and he had white. He opened with 1. e4. Now, over the years I've tried most of the major defenses to e4. I was an aficionado of the Dragon Sicilian for a while, until I noticed I kept getting mated on h7 against stronger opponents. Then it was the Scandinavian for many years. I had many good games with it, but eventually I lost confidence. If white knows what he's doing he can make things pretty unpleasant for black. So I've recently turned to the open games. This is not a move (ha!) to be taken lightly. Openings with 1. e4 e5 are the ones we all learn when we first start playing this miserable game. But it turns out that this simple, common sense beginning leads to some of the most intense tactics in all of chess. The King's Gambit alone can drive you insane. Not to mention the Goring and Evans Gambits. Heck, a lot of the time white can just sac his king's knight and get a reasonable position for his trouble. And that's before you even start studying the more reputable lines. Black can get mated pretty fast if he's not careful. I've devoted some time to studying the relevant lines, but I still find them pretty hairy. The good news is, my opponent did not test me in any of those lines. The bad news is that he chose the Scotch Game instead. The Scotch is to e4 e5 what the exchange queen's gambit is to d4 d5 openings. Boring! This is the Mieses (pronounced MEE-sis) variation. Black now has to choose between moving the attacked knight with Nb6, or pinning the c-pawn with Ba6. In his book on the open games, Marin recommends Ba6. But Bologan, in his book, prefers Nb6. The computer says they're both fine. I chose 8. ... Nb6. After the game my opponent told me he was annoyed by this, since he knw much more about the Ba6 lines. Whoo hoo! Alas, it was mostly a pretty dull game. Skipping ahead, we have black about to make his fourteenth move. Time for a pawn break. Black's got three of them to choose from: d6, d5, or f6. I chose 14. ... f6. The computer thinks this is fine, but prefers both d6 and d5. Drat! But really, for the rest of the game nothing much happens. The computer felt I had a small edge through most of it, but it doesn't point to anything dramatic that I missed. I could probably have put a bit more pressure on white than I did, but all in all it was one of my better analytical efforts. Draw agreed. The computer's evaluation is 0.00. So, after three rounds things were going OK. Rating-wise I was up about three points. The win in the second round canceled out the draw to the lower-rated player in the first. I had just played two respectable games in a row, so I was feeling good about Round Four, the Sunday morning game. My opponent turned out to be another kid who was eye-level with the pieces. This one was sporting a rating in the 1400s, however. He was playing way up. In Round Three he beat someone higher-rated than me. Well that's just peachy! Some grossly underrated kid. A win would get me basically nothing in terms of rating points, while even a draw would mean a huge hit. I had white this time. I opened with e4, and he responded with the French Defense. The Advance variation has been my main reply to the French for a while, but I'm losing confidence in it. Here's the position with white about to play his twelfth move. 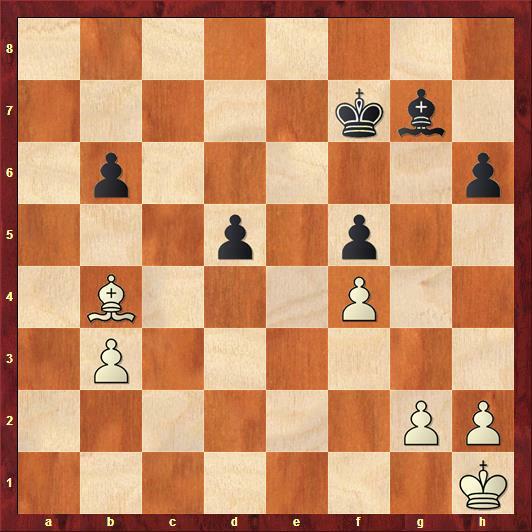 For a long time, the Advance variation was considered inferior to Nc3 or Nd2 for white on the third move. It's modern revival had much to do with the work of GM Evgeny Sveshnikov, whose creativity in the opening is well-known. (Just look at the crazy line of the Sicilian that bears his name.) When he plays the Advance, he usually ends up mauling black's kingside in a blaze of tactical glory. When I play it I just seem to end up with a weak d-pawn with little to show for it. But seriously, 1400-rated kids now know French Defense theory ten moves deep? What the frick? When I was 1400-rated I barely knew what the French Defense was. This kid was blitzing off good moves and was looking bored doing it. OK Rosenhouse, get your head in the game. Is this kid going to get the better of you? I don't think so! Book smarts only get you so far. You may have memorized a few moves my youthful opponent, but I have life experience. 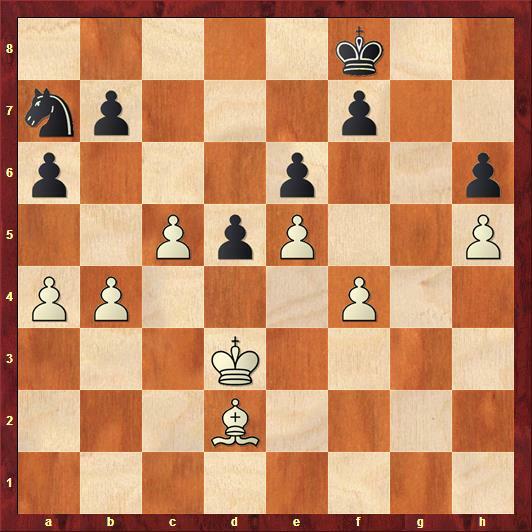 Here's the position, with white about to play his thirty-third move. The position has changed a bit. White has a healthy, mobile pawn majority on the queenside. But he is also facing a protected, passed d-pawn, and he has to do something about his bad bishop. Objectively, the position is dead level. But I was feeling good, since black really can only sit and wait, while white can make some mischief. I pushed my kingside pawns, in an attempt to give him something to worry about. That led to this position, with black about to play his thirty-eighth move. 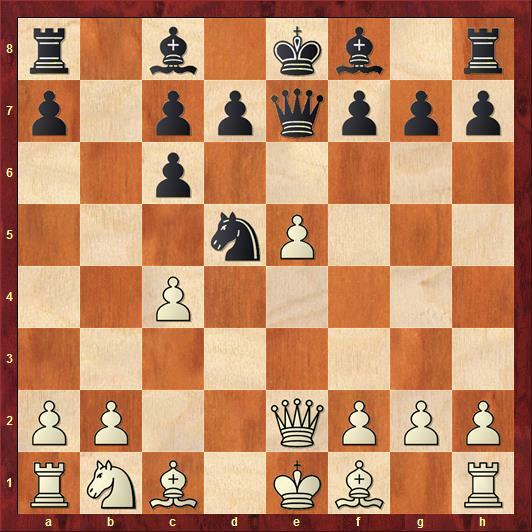 My little kingside demonstration provoked 38. ... g6. I got excited, since this creates a weakness on h6 for my bishop to aim at. I thought I might already be close to winning now, but the computer explains that the position is still level. When I move my pawn to h5 to fix the weakness, black gains the plan of transferring his knight to f5 via c6 and e7, leaving his king to defend the queenside. But black didn't play this plan. 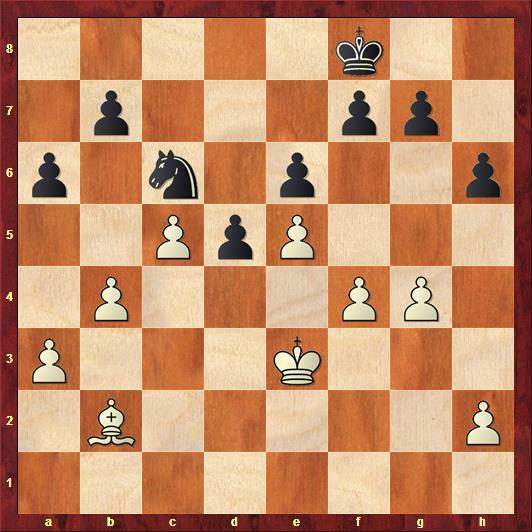 Instead we reached this position, with white to play his forty-second move. Folks, explain to me please what kind of fish doesn't play f5 and f6 here? I saw it immediately, of course. The first point is that black cannot take with exf5. That would leave black's d-pawn defenseless, after which white would just march his king right into black's position. But what then? 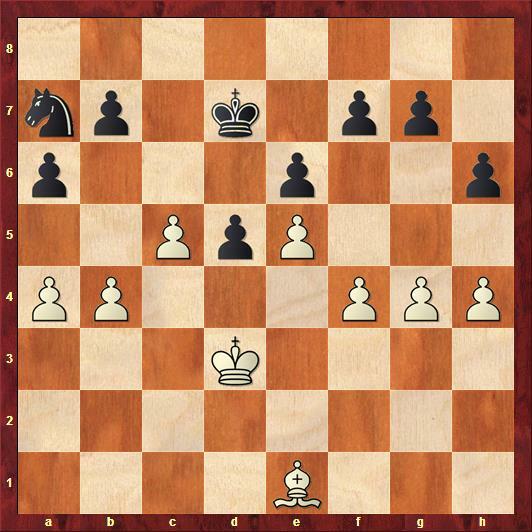 He would have to move his king over to cover the h-pawn. Pushing the pawn to f6 then locks the kingside, and forces black to just leave his king in the corner. With a little preparation, I then play the clearance sacrifice with b5. Black will temporarily be up a pawn, but then the white king will just march into the queenside. In the close-quarter fighting, the knight is no match for the king. And I saw all of this. But somehow I decided that things weren't so clear after the pawn sac. I kept finding silly lines where the knight jumps around like it's on a pogo stick, making trouble. And I thought I had an even simpler winning plan. I would just maneuver my bishop all the way to b6 and flush out the knight that way. Then I can play b5 without it being a pawn sac and just win prosaically. Sadly, it's all crap. The b5 sac wins trivially. 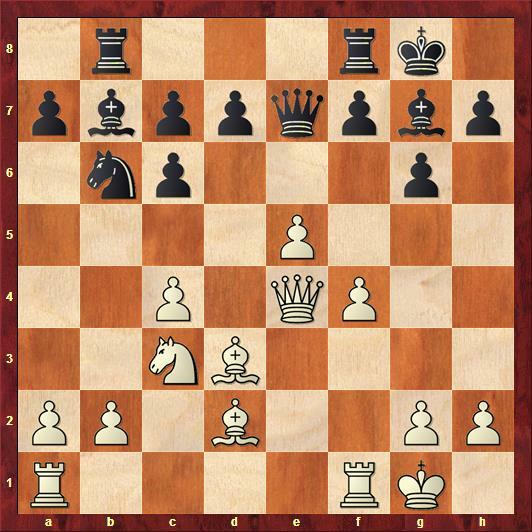 And the Bh4-d8-b6 plan doesn't work, since Nc6 will then gain a tempo for black by attacking the bishop, after which pushing the d-pawn can be a very effective decoy. The position is just completely blocked and white cannot make progress. I made him shuffle the pieces around for another twenty moves, but white's moment has passed. Draw agreed. That little draw cost me sixteen rating points. Oh well. Going into the city was a good idea. I needed some time to shrug off my disappointment in round four. That brings us to Monday, the final day of the tournament. Now, I had already decided to skip the last round. It was a two-drive home, after all, and I needed to get ready for class the next day. And once you check out of the hotel it's awful to have to sit around the lobby for hours waiting for the round to start. That meant I only had one more game to play, on Monday morning. It turned out to be a doozy! Stay tuned! Here's a small bet: against a player rated 500 points HIGHER than you you would have smacked down 42. f5, without lots of analysis. That fear of losing rating points (32 !! if your opponent somehow manages to win with some trick you overlook) is quite pervasive in chess. Leads to a lot of "Ill just play it safe & wait for him to blunder" moves. 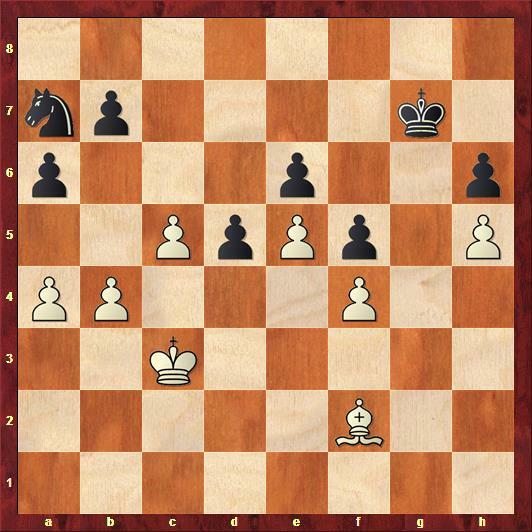 Re the Bishop -to - b6 plan: I think you mean the ...Nc6 move attacks the White b-pawn, not the Bishop, right? In which case pushing the Black d-pawn would be a quite forcing decoy indeed, if White protected the b-pawn with his King. But I wonder if White could just proceed immediately with a b5 push here instead of King to c3. I feel like I'm probably missing something simple, though. Anyhow. I eagerly await your Monday doozy. Thanks for posting this stuff! Like I said, something simple. You mean the knight hops to c6 when White plays Bd8. Of course. As White my results against the French enormously improved when I started to play 3.Nc3 and against the Nimzowitsch 4.e5. If you prefer an open game 4.a3 Bxc3+ 5.bxc3 dxe4 6.Qg4 is pretty good (unfortunately 6.f3 is unreliable). That's the nice thing about 3.Nc3. White gets to decide if there's going to be fire on board (3.Nc3 Nf6 4.Bg5 dxe4 5.f3 even can become the notorious Blackmar-Diemer, Euwe Defense) or that things will remain quiet. Boring stuff like the Scotch made me give up 1...e5, though in this particular case the risky 4...Qh4 can become very messy very quickly. I think you're right that I should probably just take up 3. Nc3 against the French. I got scared off a while back by those main line Winawer's, where white steals a pawn on the kingside but then has to play grim defense for twenty moves. But there are plenty of lines against the Winawer that don't require such things. "white steals a pawn on the kingside but then has to play grim defense"
7.a4 iso 7.Qg4 is pretty good, quite solid, relatively uncommon and not hard to understand. 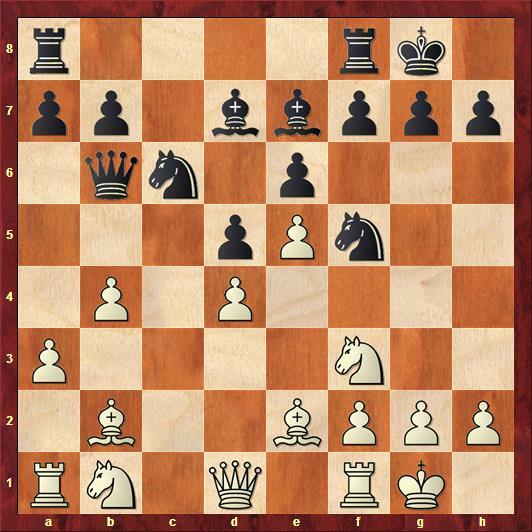 Williams and Moskalenko both recommend Qa5 8.Bd2 Nbc6 9.Nf3 Bd7 and now 10.Be2 f6 11.c4 Qc7 12.exf6 gxf6 13.cxd5 Nxd5 14.c4 Nde7 15.d5 exd5 16.cxd5 Nxd5 17.O-O s an interesting gambit. Sound development, active pieces, pair of bishops in an open position, vulnerable black king: that's a lot of compensation for a pawn, even if chances are objectively equal.